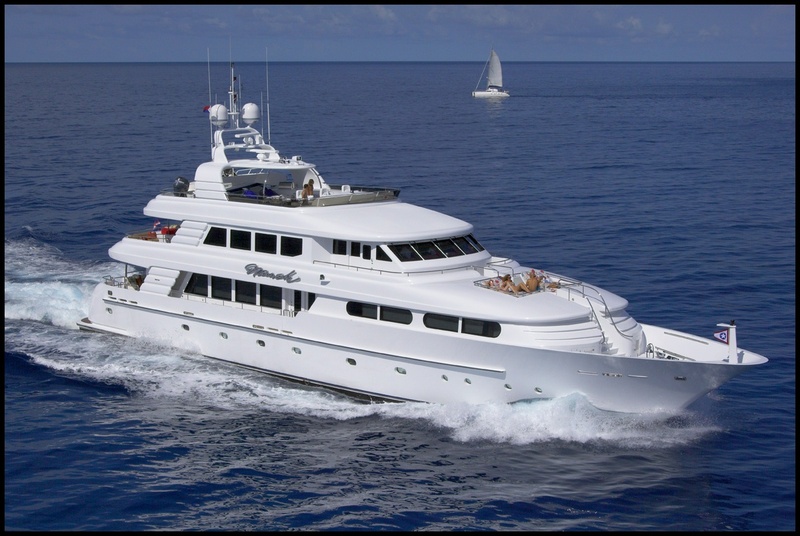 M/Y NICOLE EVELYN is a 2003 38 meter (125 Feet) Cheoy Lee motor yacht with naval architecture by Mulder Design. 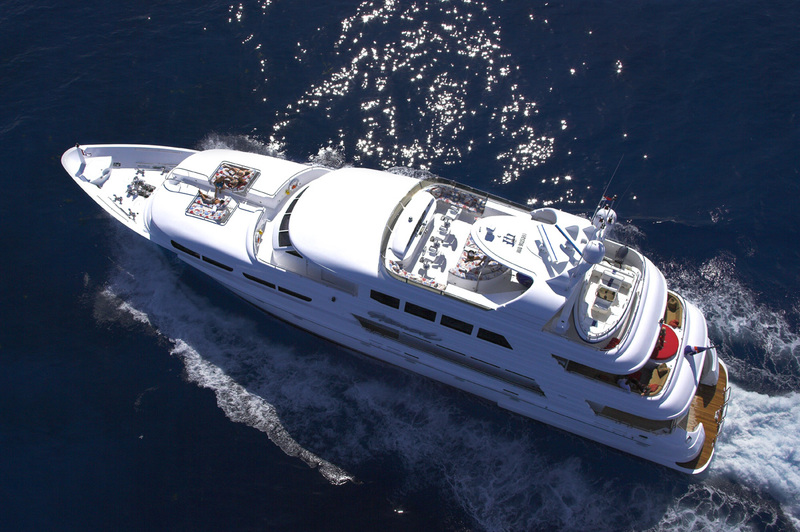 She is a wonderfully balanced yacht providing guests with all the delights of luxury yachting. 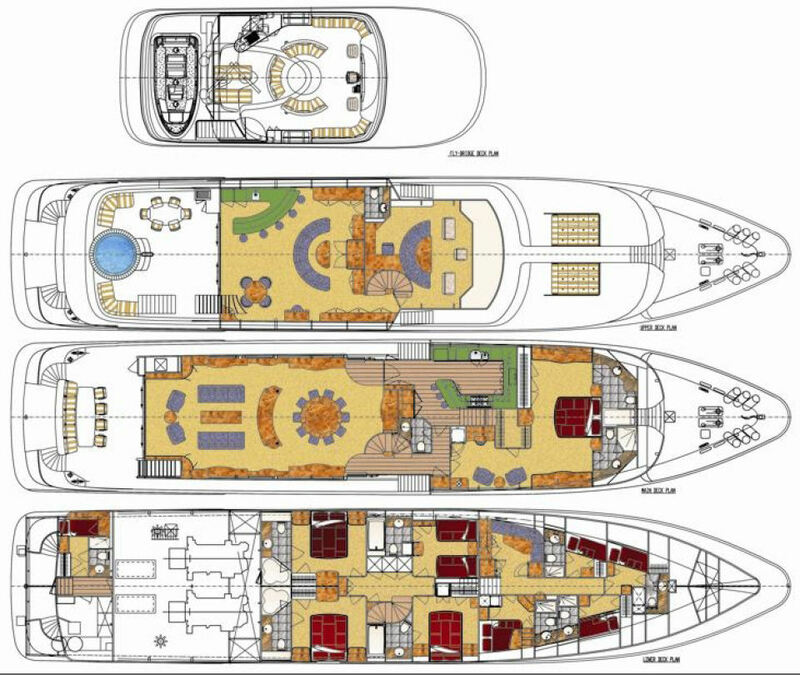 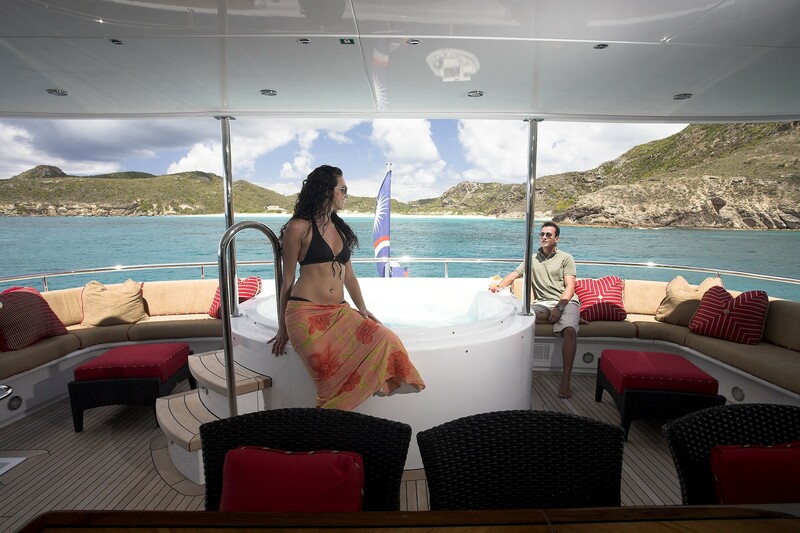 She has an outdoor Spa Pool, al fresco dining options, a bar, formal dining, good sunning areas as well as generous interior accommodation for up to 10 guests in 5 cabins. 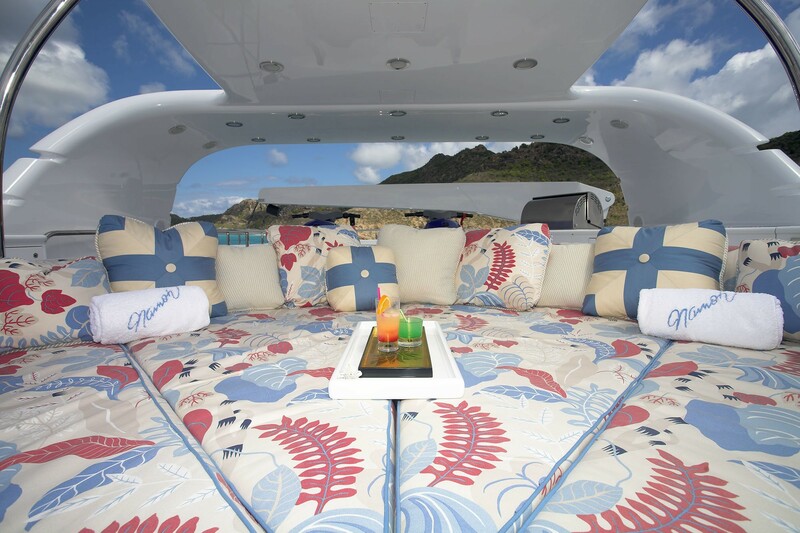 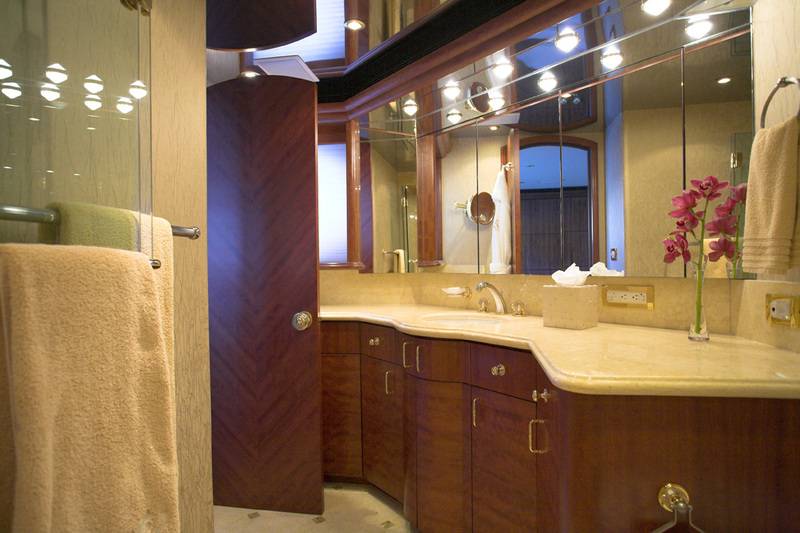 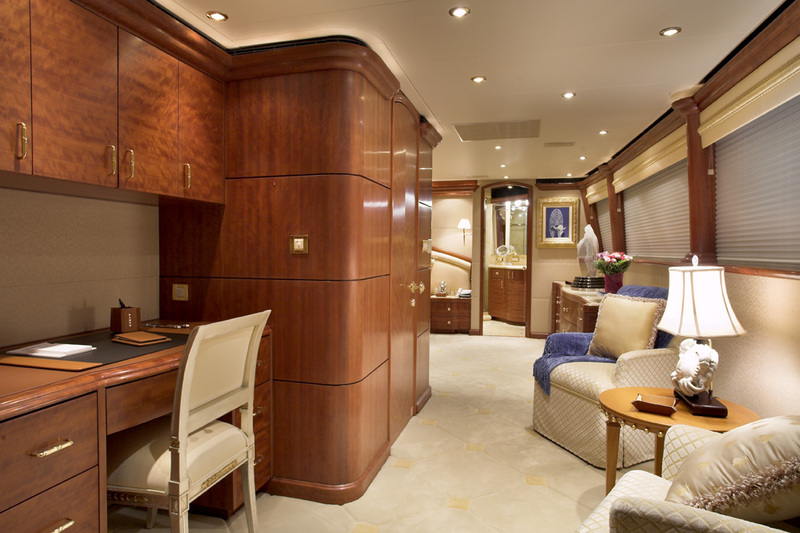 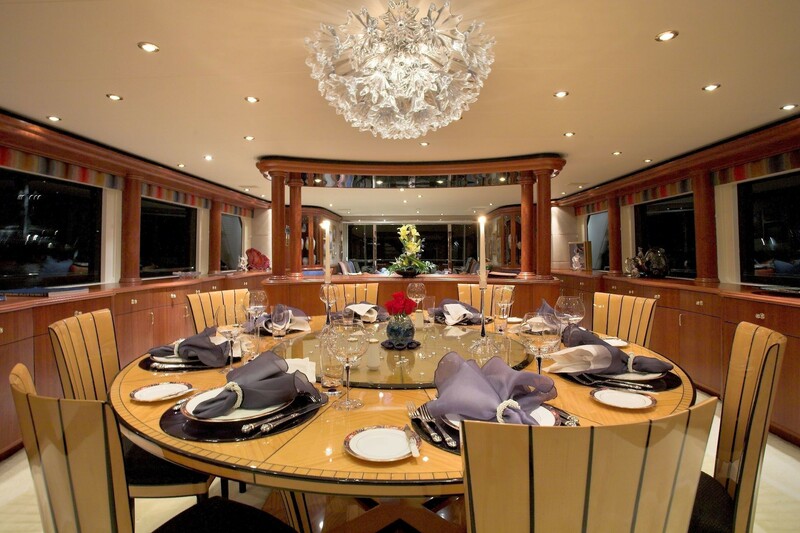 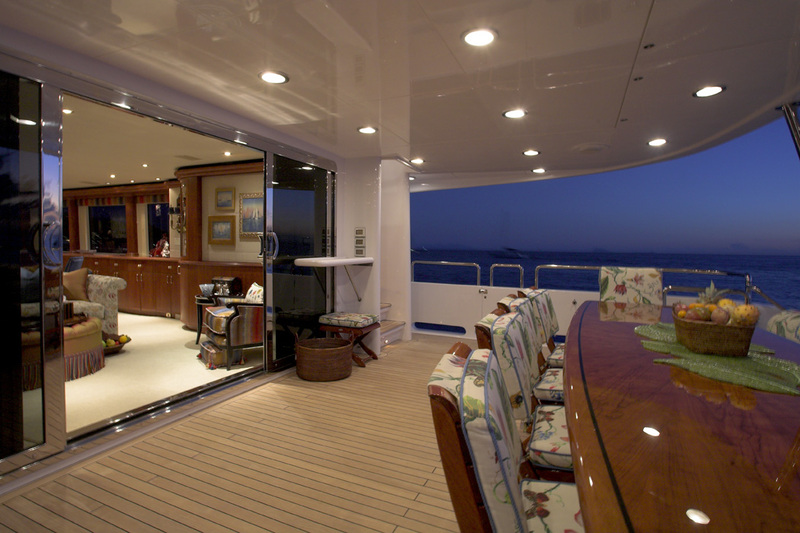 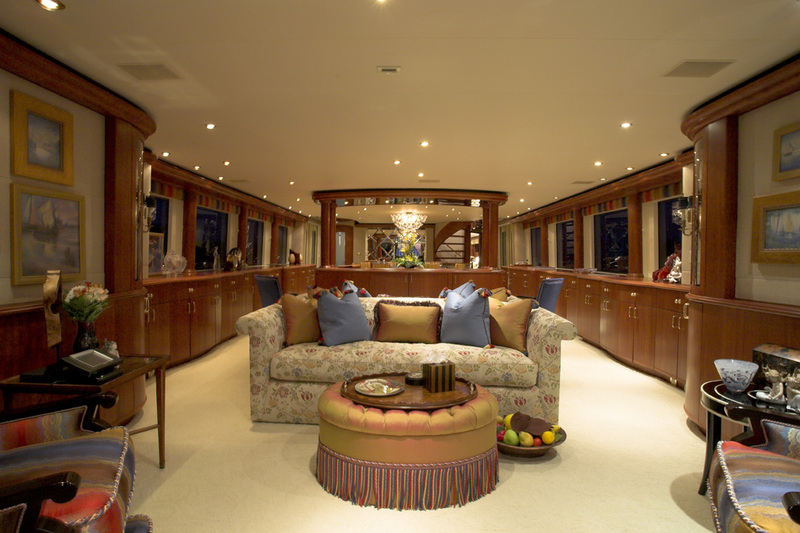 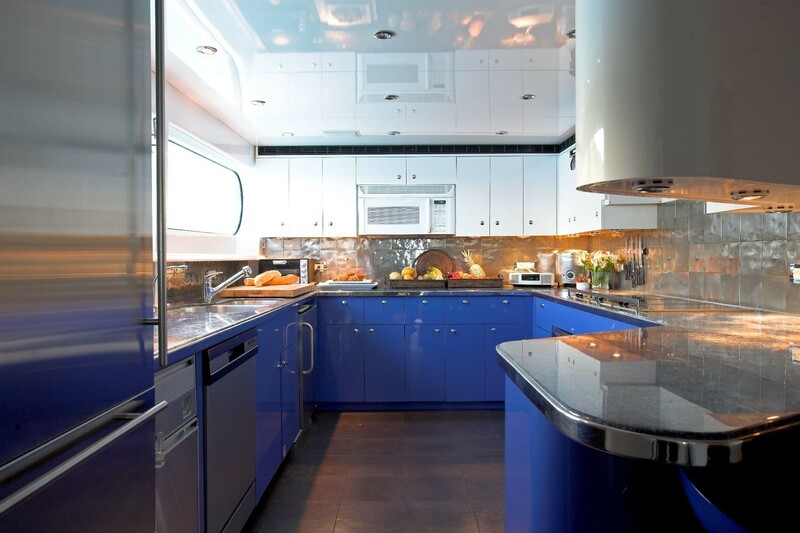 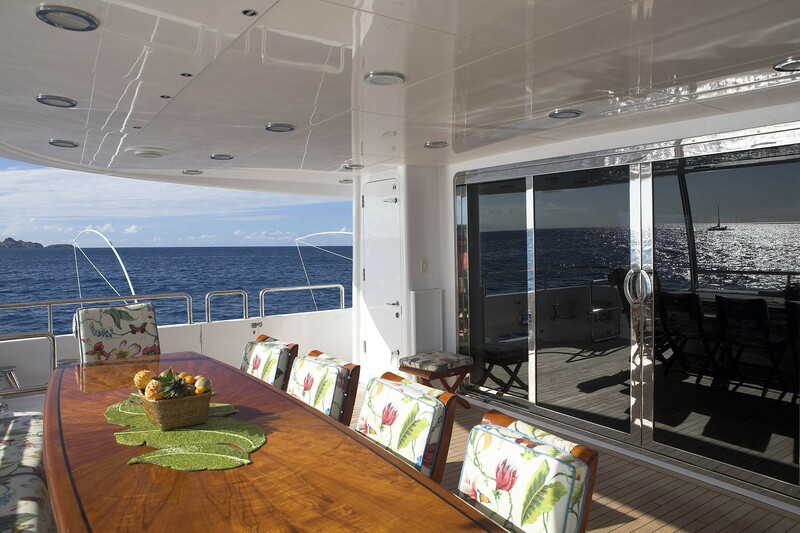 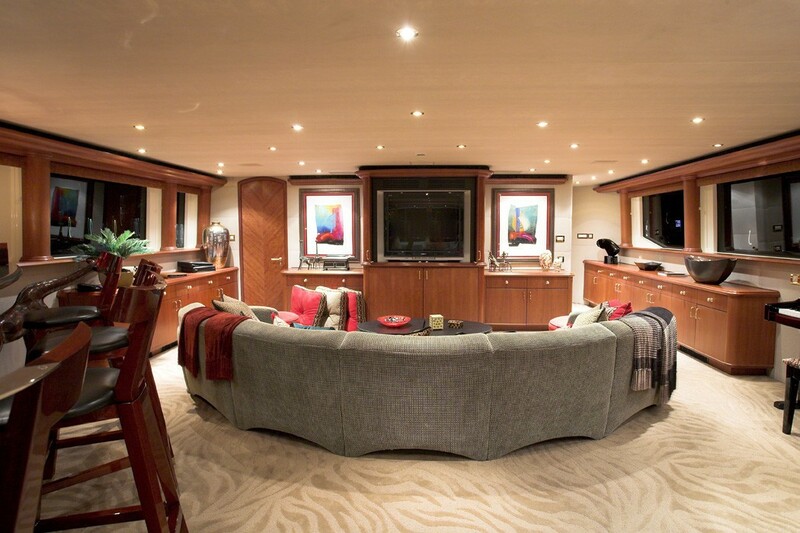 Motor Yacht NICOLE EVELYN has an open style main salon and dining area separated only by beautiful custom designed cabinetry which houses a popup TV screen to allow guests to enjoy viewing from either the salon or dining area. 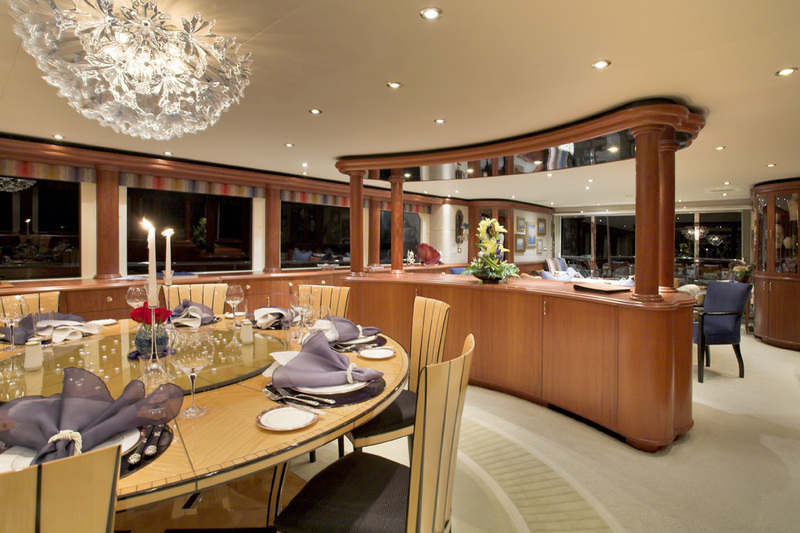 Her formal internal dining area is circular providing wonderful dynamics and is complemented by spacious surroundings and long, wide windows. 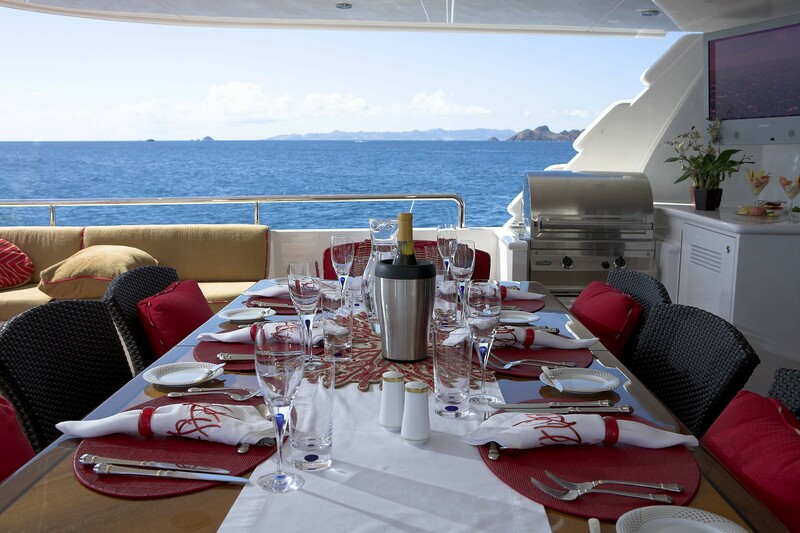 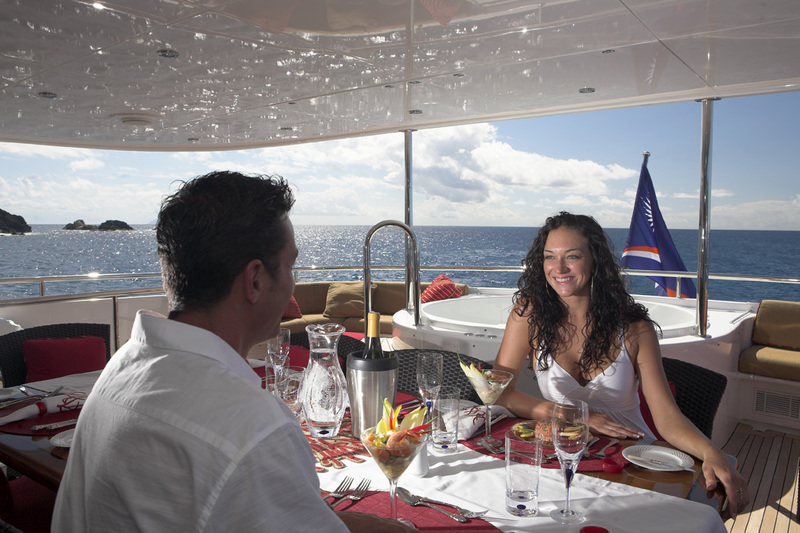 Comfortable dining in an alfresco atmosphere is also available on her aft deck at her beautiful mahogany table which seats 10 guests. 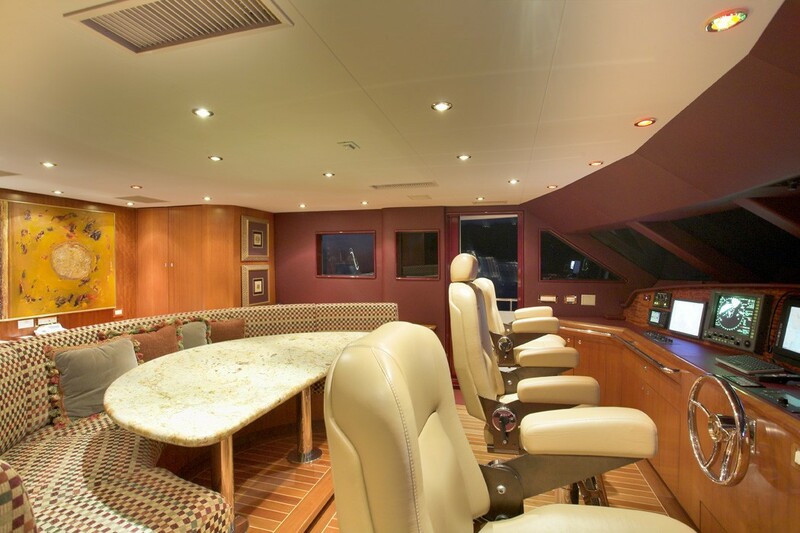 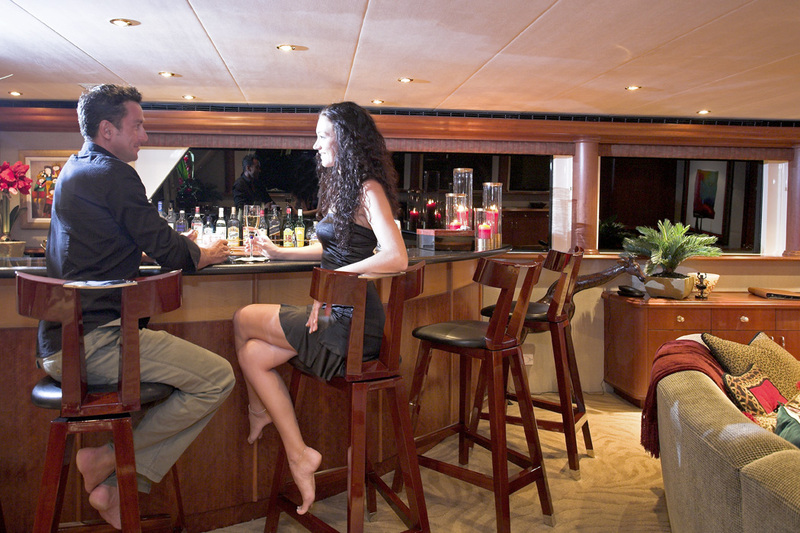 One of the best areas onboard for entertaining though is the upper deck with a fantastic skylounge including a stylish bar with stools, sofas, audio-visual facilities, a card table and an electric piano for some live fun. 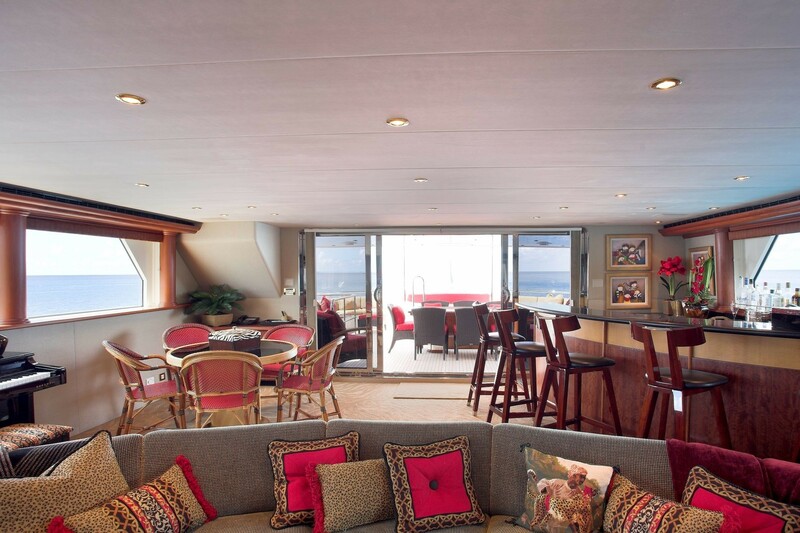 The skylounge salon leads aft to the deck which offers further entertainment facilities with a flat screen TV, coffee table style tables and chairs and a Spa Pool spa bath. 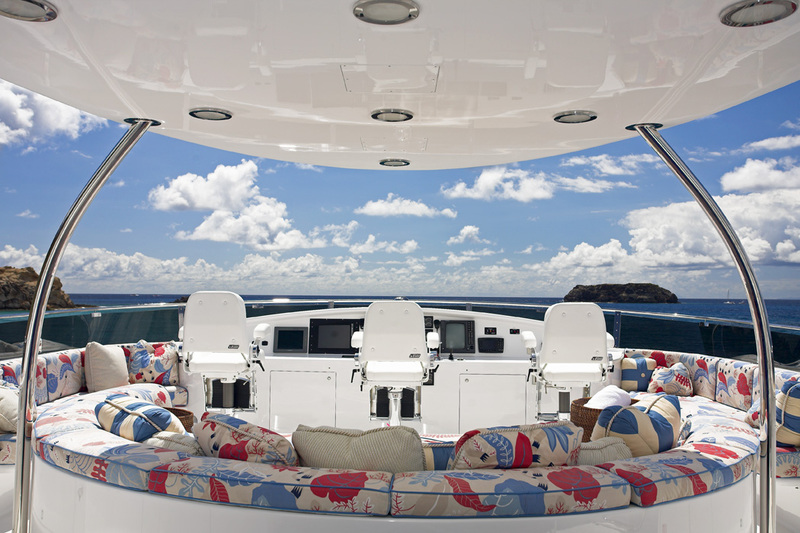 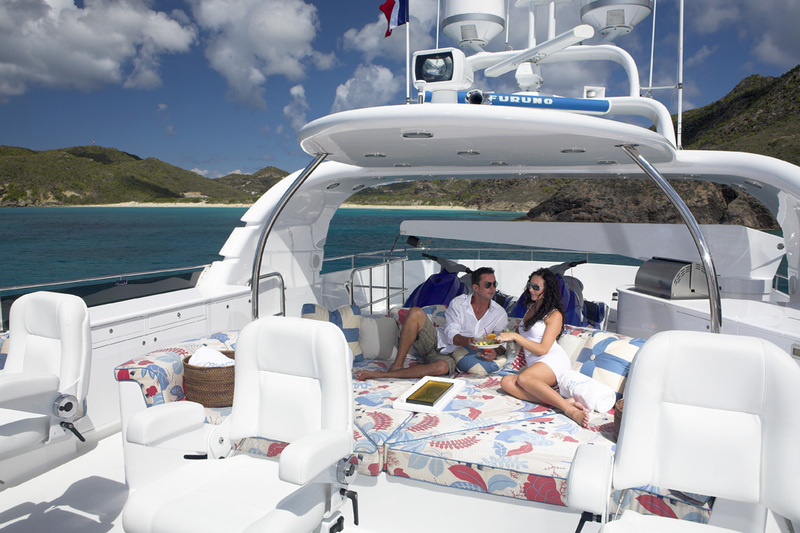 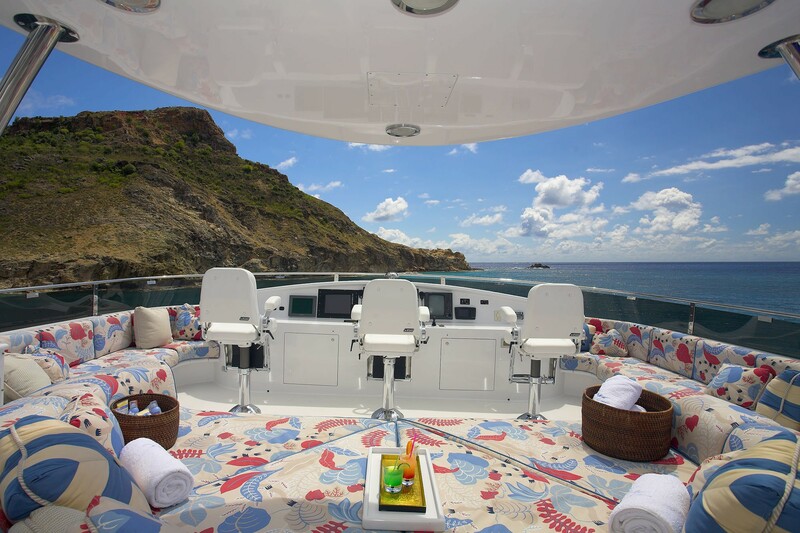 The sundeck on Motor Yacht NICOLE EVELYN is a wonderful place to soak up the Caribbean sun and take in the fantastic views on the helm chairs, sunpads or lounges. 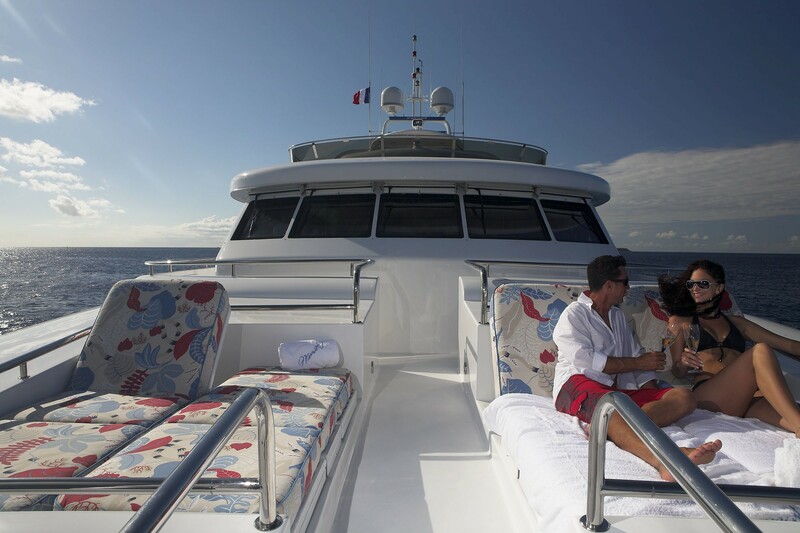 The sundeck is a great place to enjoy cocktail hour, a casual BBQ or simply while the time away relaxing with a good book. 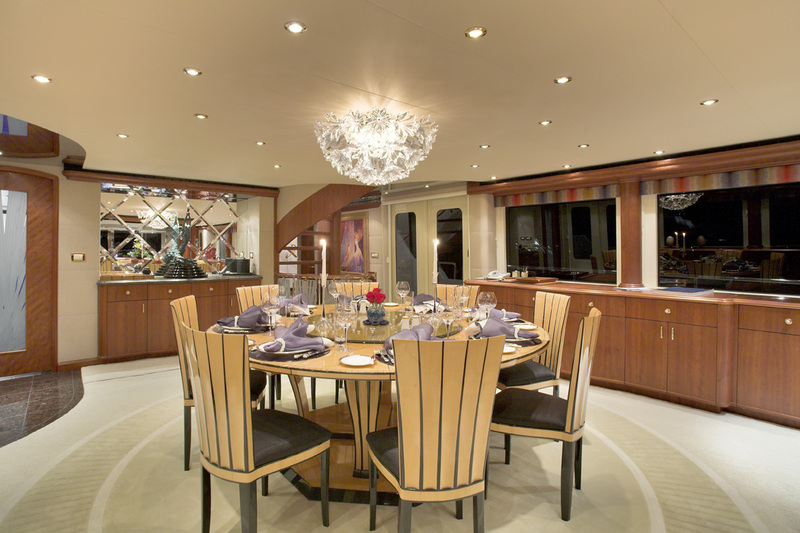 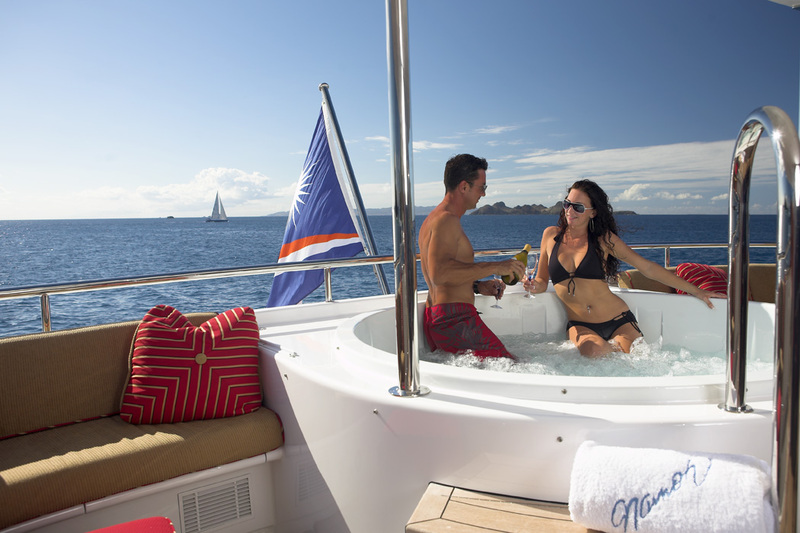 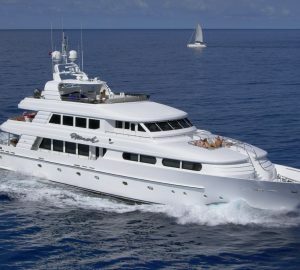 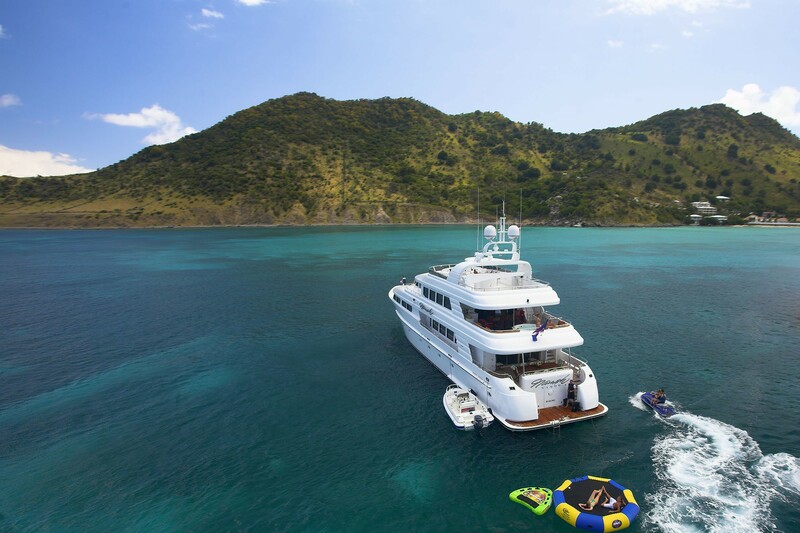 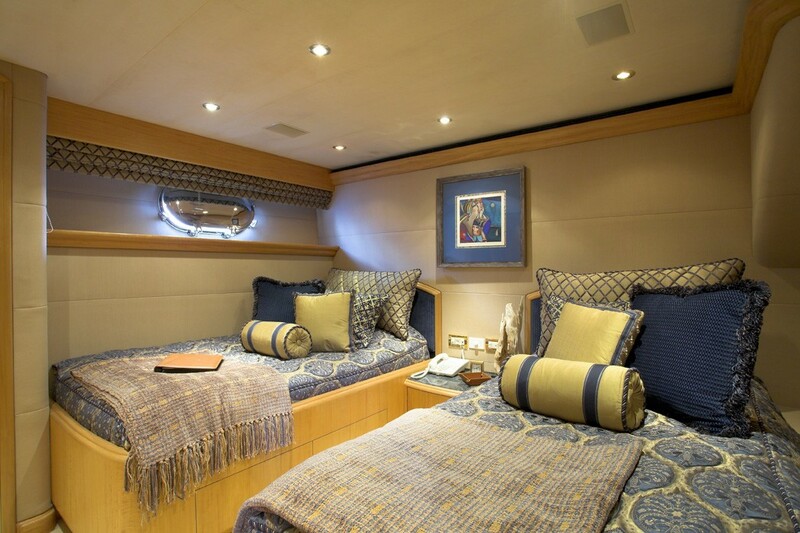 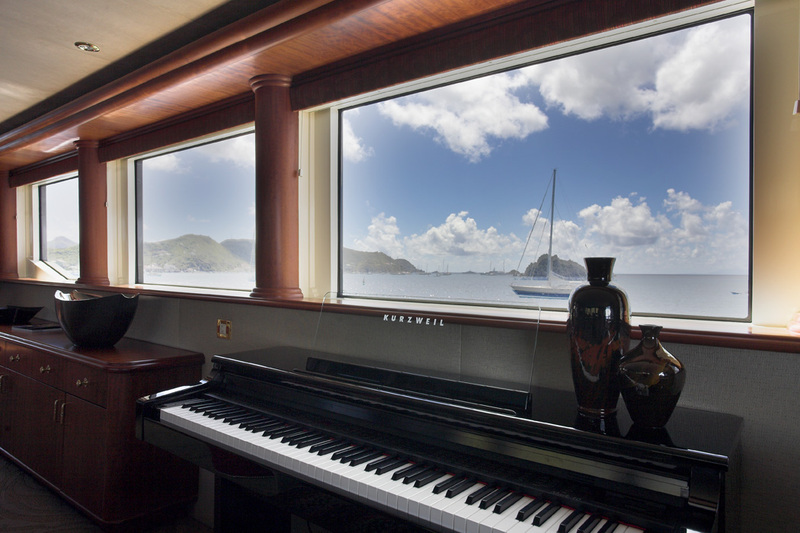 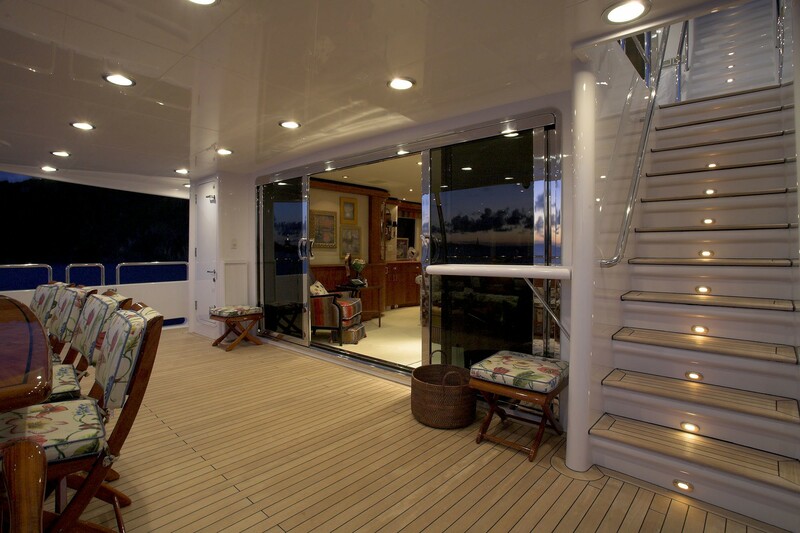 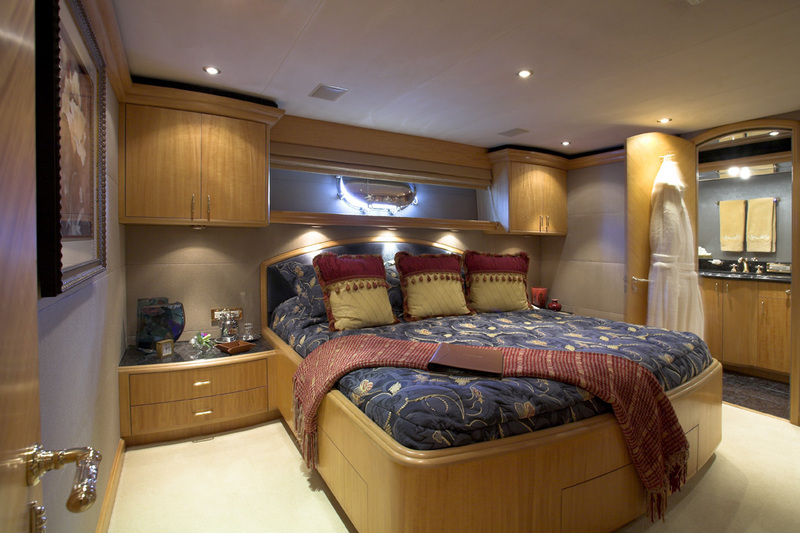 Motor Yacht NICOLE EVELYN offers luxurious accommodation for 10 guests in 5 separate staterooms. 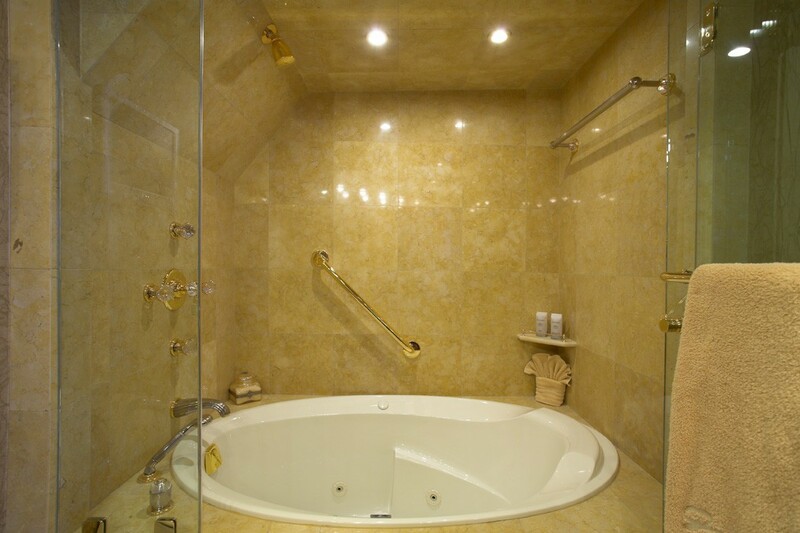 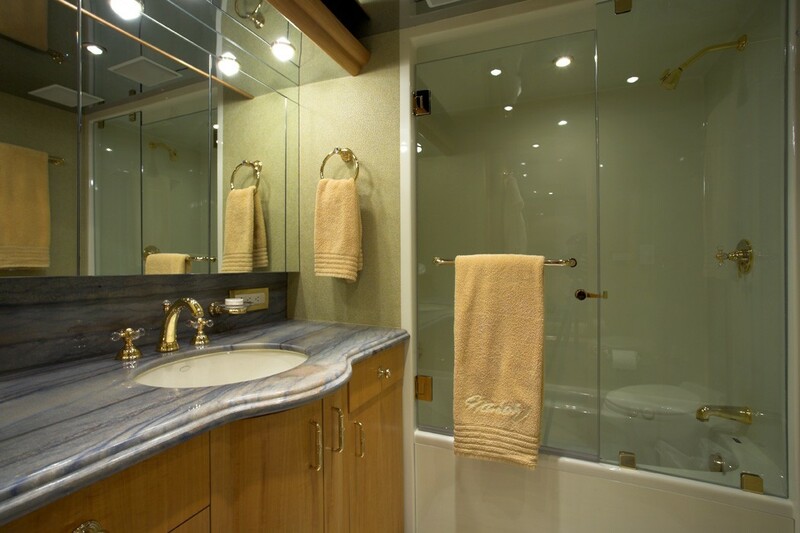 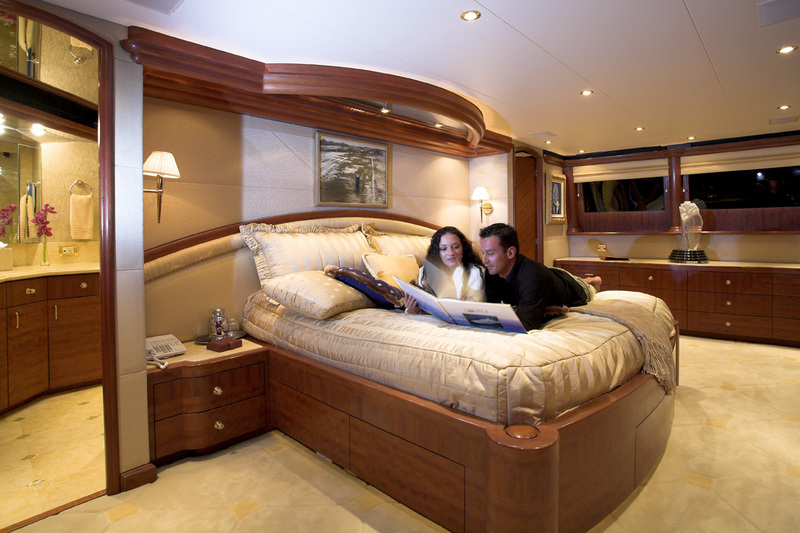 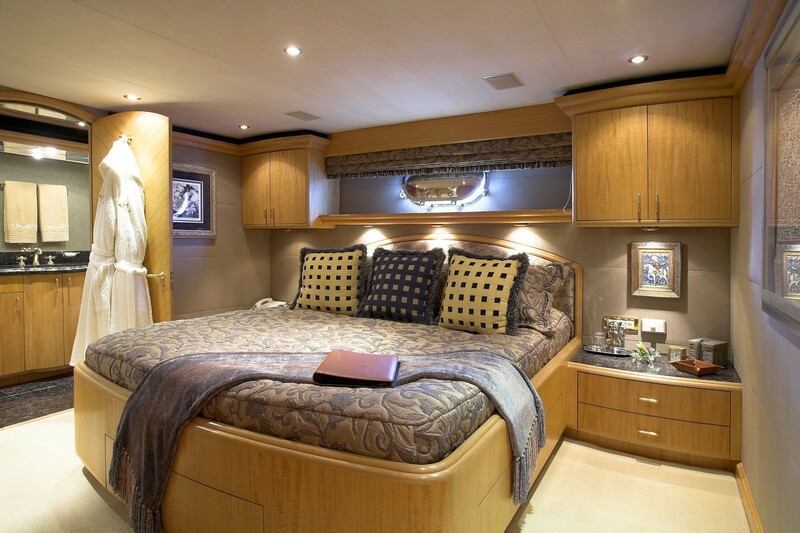 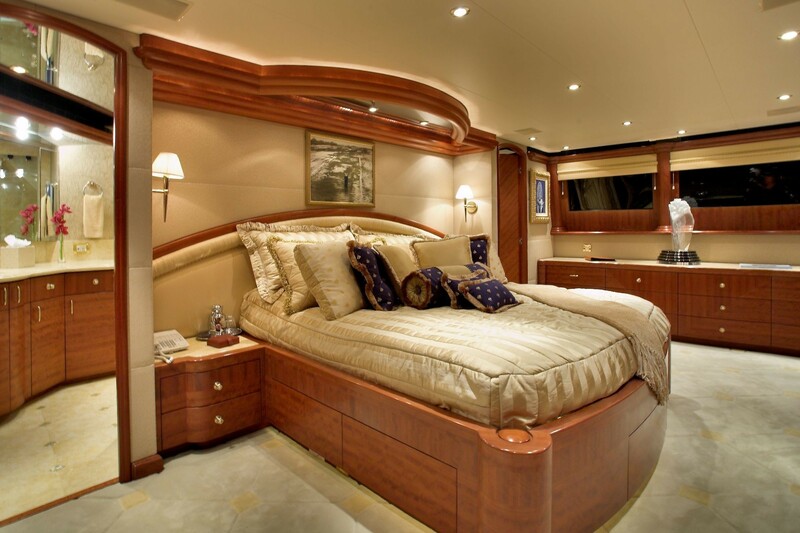 The master stateroom stretches the full width of the beam and has a king sized bed, a private office, ample closet and hanging space and a luxuriously appointed ensuite with his and her facilities including a Spa Pool tub with a steam bath. 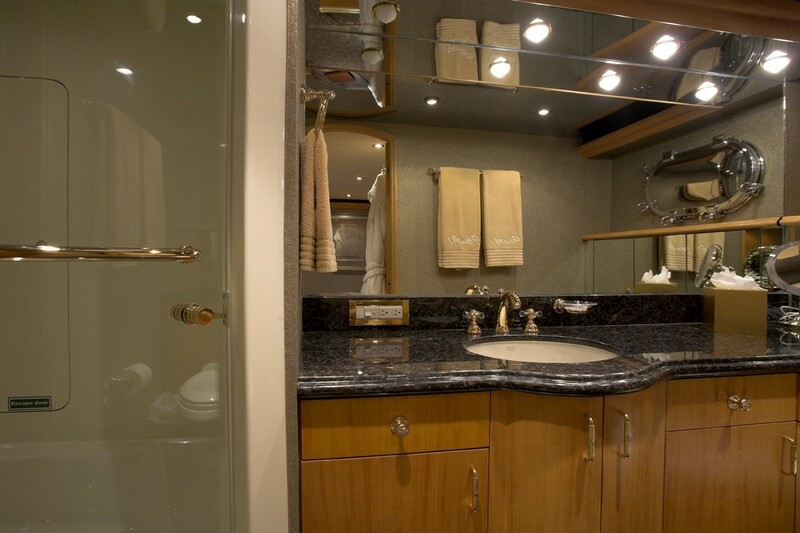 The further guest's cabins consist of two further kings, one queen and one twin, all with audio-visual facilities and private ensuite bathrooms with Spa Pool tubs.